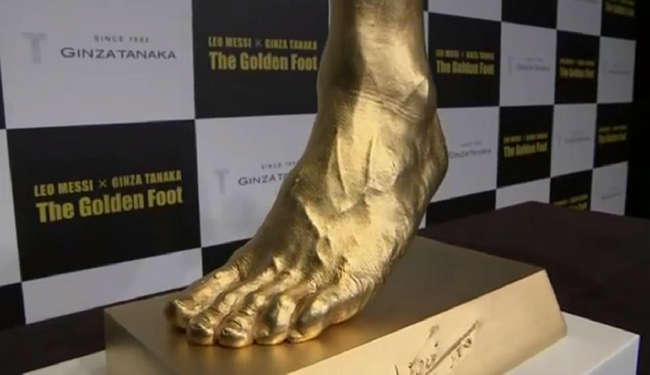 Japanese Jeweler Makes Solid Gold Cast Of Lionel Messi’s Left Foot – Yours For Just £3.5m! A Japanese jeweler by the name of Tanaka Kikinzoku has produced a pure gold model of Lionel Messi’s left foot, which was revealed to the public in Tokyo yesterday. Tanaka took a casting of Messi’s foot at the tail end of 2012 and now, three months on down the line, the 25cm-tall, 25kg replica was unveiled by none other than Lionel Messi…’s brother, with the announcement that the sculpture is available for purchase and that it could be yours for the incredibly reasonable price of just $5.25million (around about £3.5million). Tanaka also confirmed that a portion of the profits would be donated to Lionel Messi’s foundation which in turn would be going on to support children in areas still affected by the tsunami that hit Japan back in 2011. That’d look great on our mantelpiece. Put us down for two.